On the AAU scene, there are plenty of teams that are phenomenal and that have held their own on the hardwood this spring. But there is one quintet of players that stand out above many others. This crew of players plays for the famed SportsU organization from New Jersey. SportsU, which is sponsored by Under Armour, is a program that needs no introduction. They have produced plenty of outstanding talents in the last few years on the Division I level, such as Wade Baldwin (Vanderbilt), Dallas Anglin (Northern Colorado), Hallice Cooke (Iowa State), Jared Nickens (Maryland), DeAndre Bembry (St. Joseph), Quinton DeCosey (Temple) and one of the top prospects in the 2015 NBA draft, Karl-Anthony Towns (Kentucky). The program continues to flourish on all levels. But their most dominant program is on the 15U level. That team is now 8-0 on the Under Armour Association league and have won the championship at the Providence Hoop Group Jam Fest. The quintet in question is a group of players that are very talented and are poised to play on the Division I level in a few years. The quintet is Jahvon Quinerly & Luther Muhammad of Hudson Catholic High School in Jersey City, Atiba Taylor of Hackensack High School in Hackensack and Louis King & Nazreon Reid of Roselle Catholic High School in Roselle. Quinerly and Muhammad are two guards that know how to shoot, but are huge offensive threats in the lane when they have the ball in their hands. The 6-0 Quinerly and 6-2 Muhammad both led Hudson Catholic to a 24-4 record this season & a Hudson County championship. Quinerly is a quick, deceptive guard that has a nice handle and can score from many places on the court. He holds offers from Villanova, St. John’s, Seton Hall and Rider. Muhammad is an athletic guard that finds ways to score. As great as he is on offense, he is also superb on the defensive end. He only holds a lone offer from Rider. The 6-3 Taylor is a pure point guard who has an effective skill set. He is also known for scoring baskets efficiently and making great shots from the outside. He was one of the key cogs on a Hackensack team that went 16-11 this season. He holds a lone offer from Manhattan. King, a 6-6 forward is long, athletic and can rebound, but also can play under the basket as well as shoot from 15-20 feet. He spent most of the time on the JV team this year at Roselle Catholic this year, but holds offers from Syracuse, VCU, Manhattan & St. John’s. Reid, a 6-8 forward, is a powerful presence down-low. He can block shots, rebound superbly, shoot from 15-20 feet, and can throw it down with little problem. He is ranked as one of the top 10 players nationally in the Class of 2018. He was also one of the main cogs on the Roselle Catholic team that finished No. 20 in the country and No. 1 in the state of New Jersey, as well as the winners of the Non-Public B State Championship and New Jersey Tournament of Champions. Reid holds offers from LSU, Kansas, UConn, Maryland, North Carolina State, Seton Hall, St. John’s, Villanova, Oklahoma, Virginia & Iowa. You can catch more of Sports U & their heralded quintet this summer as they will be playing in major tournaments such as the Southern Jam Fest, Rumble in the Bronx, UAA Finals & the Fab 48 tournament in Las Vegas. Many people are amazed at the talents of these five young hoopsters. 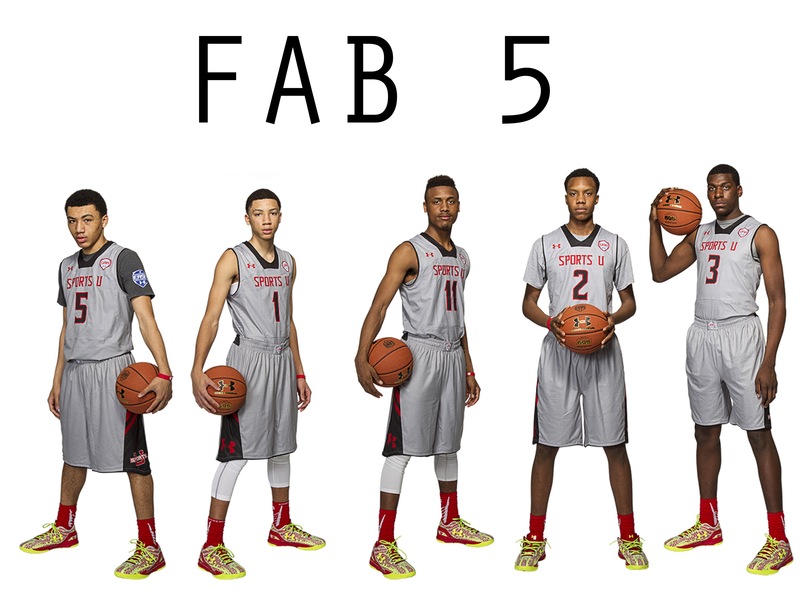 They have plenty of potential to be great players at a Division I school in the future. The interesting part of this that they will only get better as time goes on.